Tagged under Masakazu Katsura, Studio Pierrot, Series. 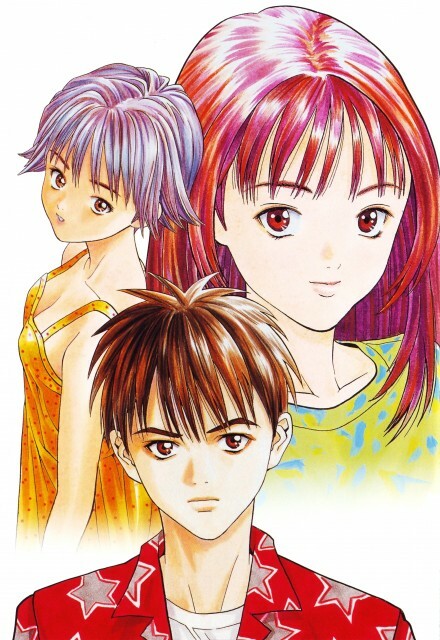 Despite being a person who has an extremely hard time talking to girls, Ichitaka Seto has developed a big crush on one of his school's most popular students, Yoshizuki Iori. But all is not lost, for Yoshizuki Iori also has a crush on Ichitaka Seto. Two big questions remain: will they discover each others' feelings in time? If so, will they be able to survive the ups and downs of a relationship after high school? Through the 15-volume series, we come to understand what a person may wind up doing for the sake of reaching a dream. For me, I almost take away from the series the inspiration to want to further my education to reach a financial plateau that I know I may not get to until I'm 80-years old in my real line of work. For Seto, his dream was to overcome his personal doubts and personality short-comings to reach the woman he has only dared to look at from afar. Through each volume of the series we are consistently bombarded with failure, then success in an almost rhythmic manner. However through this pacing we are at least rewarded with achievements even though we are only the bystanders to this journey. Really very good, Masakazu is a big one. It represents a profound love story, surrounded by clear terrestrial environments and situations. This beautiful girl that runs behind the school, almost an idol that is upset by a series of events .. I started the manga cause someone recommended it, women are into lovu lovu crap so I took it on xD It was nicely drawn, a bit cliche, but I guess is okay if you want to waste some time. Also men like the lead guy really need more balls. visually pleasing, female leads cute at its time. character of iori complex and sensitive. the most noteable character. a realistic story with a bunch of well developed characters made it all more easily to relate to. artworks as usual great and high quality. fan service seems excessive at times. Could it have been any more real? no way. this was the first manga i read and will never leave my number one spot. it had a larger than life story line and real world situations that didnt seem like they couldnt happen, or that it would never happen. i liked the guys perspective on the manga. it had a real life take on the mind of a young boy who meets his dream girl. especaly the cant stop thinking about her part. but this anime and the manga gets big points on the we went there side. a lot of people who read ichigo 100% will love this ending becase they hated ichigos final choice in the manga. But this anime and manga it a easy 9.75/10. comics ch1~15(own country translated), original comic ch 1~15 which REALLY I DONT UNDERSTAND THE LANGUAGE, downloaded comic (english) ch 1~15. vcd the 1st ova, dvd 2nd ova ch 1~6. i dont have iori and izumi, and i still pray into god, perhaps collecting her pics it will make it happen.